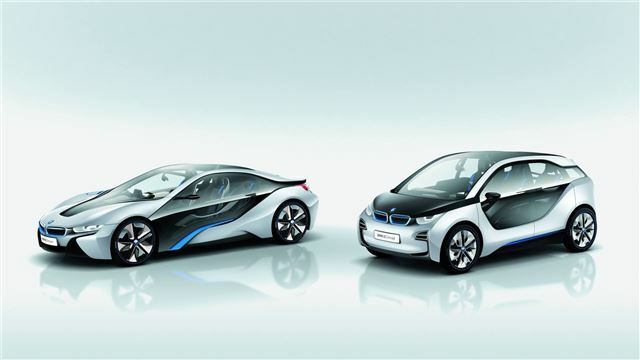 Details have been released of the first two concept cars in BMW’s ‘i’ sub-brand, the i3 – an all electric family hatchback, and the i8, a high performance hybrid coupe. The i3 is a family hatchback type vehicle, designed with sustainability and environmental friendliness in mind. It's powered by an electric motor which produces 170hp and a hefty 250Nm of torque, and as it’s an EV all of the torque is available from zero revs. That means impressive performance, with the i3 hitting 62mph in less than eight seconds. More importantly, the i3 is built to be clean and kind to the environment. Many components of the cabin, which BMW has called the ‘Life module,’ are made from natural or recycled materials, right down to the tanning process of the leather seats. The Life module is mounted on top of the 'Drive module,' which is made up of the chassis and drivetrain. The cabin is designed to be light, airy and welcoming, and is fitted with technology to allow the driver and passengers to connect with their life outside the car easily and quickly, as well as safety equipment to make driving easier, particularly in slow moving town traffic. The i3 is a four seat, family focussed car with practicality at its heart. The i8, on the other hand, is aimed at dynamic, entertaining driving, but without compromising fuel consumption and emissions. The i8’s plug-in hybrid drivetrain is made up of a 220bhp three-cylinder engine which is mounted at the rear, and an electric motor at the front, batteries for which are mounted under the floor between the axles, improving weight distribution and providing a low centre of gravity. The result is high performance, with 0-60mph taking just 4.6 seconds, and typical rear-drive BMW handling, coupled with potential fuel economy of 94mpg. It can even travel around 20-miles on electricity alone. The attractive and radical 2+2 design has space for four, with a driver focussed cabin designed to immerse the driver in the experience of driving. There is no news yet on when we can expect to see more of the BMW i models, or if we'll get to drive them, but we'll bring you more information when it's available.